Varicose veins are the result of a vein’s inability to properly pump blood upwards through your body. When a vein is unable to pump the blood upwards, the blood pools in the lower leg which causes the veins to swell and ache. Prolonged sitting or standing makes it harder for your body to maintain upward blood flow. When we walk the muscles in our calves give a good squeeze to the leg veins and help propel blood back to the heart. This muscle pumping action with walking accounts for 70% of the blood that leaves the legs. Without that pumping action from your calves, the blood stays down in your legs and pools. That’s what causes the swelling. Good circulation is a must have for good vein health and walking is the perfect exercise to promote good vein health. Walking is a low-impact activity that stretches and strengthens your calf muscles, thereby improving your blood flow. 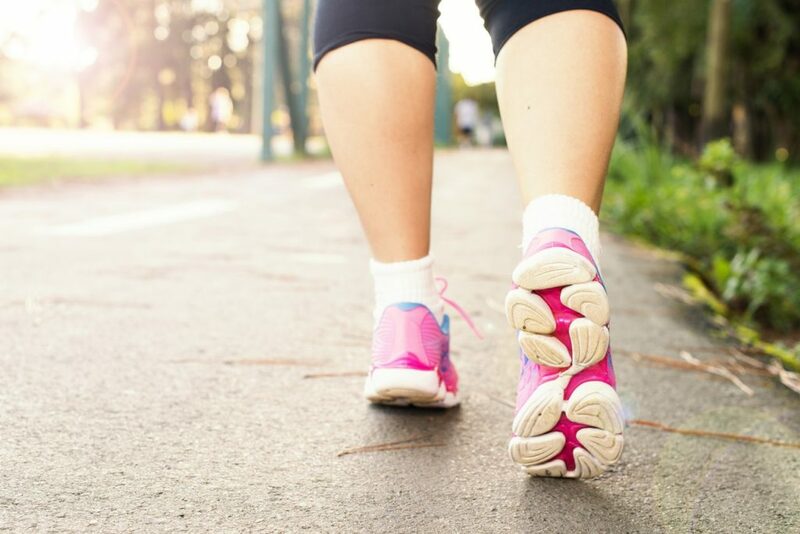 Set a goal to walk 30 minutes a day, park a little further away when shopping, take a quick activity break if you’ve been sitting for too long – 20 steps is all it takes…. Interventional radiology (IR) is an exciting area of modern medicine delivering precise, targeted treatment for complex diseases and conditions throughout the body. Using minimally invasive image-guided techniques, interventional radiologists provide high quality care with less morbidity and often at a lower cost than many surgical alternatives. Interventional radiology (also known as IR) is the minimally invasive, image-guided treatment of medical conditions that once required open surgery. By utilising the power of advanced medical imaging such as ultrasound, X-ray, CAT scan and MRI interventional radiologists can see inside your body and treat complex conditions less invasively and with unprecedented precision. Interventional radiologists are on the front lines of clinical advances and use of the latest image-guided technologies. They are board-certified physicians who are trained in both radiology and minimally invasive therapies. Interventional radiologists work across the body to deliver minimally invasive treatments for a variety of conditions. An X-ray exam of the arteries and veins to diagnose blockages and other blood vessel problems; uses a catheter to enter the blood vessel and a contrast agent (X-ray dye) to make the artery or vein visible on the X-ray. Opens blocked or narrowed blood vessels by inserting a very small balloon into the vessel and inflating it. Used by Interventional Radiologists to unblock clogged arteries in the legs or arms (called peripheral arterial disease or PAD), kidneys, brain or elsewhere in the body. Insertion of a tube beneath the skin and into the blood vessels so that patients can receive medication or nutrients directly into the blood stream or so blood can be drawn. Delivery of cancer-fighting agents directly to the site of a cancer tumor; currently being used mostly to treat cancers of the endocrine system and liver cancers. Delivery of clotting agents (coils, plastic particles, gel, foam, etc.) directly to an area that is bleeding or to block blood flow to a problem area, such as an aneurysm or a fibroid tumor in the uterus. Pelvic congestion typically leads to pelvic pain. This can be managed very successfully with a minimally invasive procedure to occlude the veins that have led to the symptoms. An embolisation procedure of uterine arteries to stop life-threatening postpartum bleeding, potentially preventing hysterectomy. The same procedure is used to treat fibroid tumors and is then called UFE (Uterine Fibroid Embolisation). A treatment for “varicose veins” in the scrotum, which can cause male infertility and pain. Feeding tube inserted into the stomach for patients who are unable to take sufficient food by mouth. Use of angioplasty or thrombolysis to open blocked grafts for hemodialysis, which treats kidney failure. In some patients with high blood pressure, the condition is caused by a narrowing of the arteries in the kidneys. The problem, called renal hypertension, often can be treated with angioplasty. Use of radiofrequency (RF) energy to treat cancerous tumors. Dissolves blood clots by injecting clot-busting drugs at the site of the clot. Treats blood clots in the brain to reverse the effects of stroke; treats deep vein thrombosis in the leg to prevent permanent disability. The ureter carries urine from the kidneys to the bladder and sometimes becomes blocked by kidney stones or other obstructions. The interventional radiologist inserts a catheter through a small nick in the skin and into the blocked kidney to drain the urine. A tiny cage-like device that is inserted in a blood vessel to break up clots and prevent them from reaching the heart or lungs. Prevents pulmonary embolism. Using ultrasound/ Fluroscopy/ CT guidance, Interventional Radiologists can provide chronic pain patients with relief using precise injections into a range of joints and vertebrae. 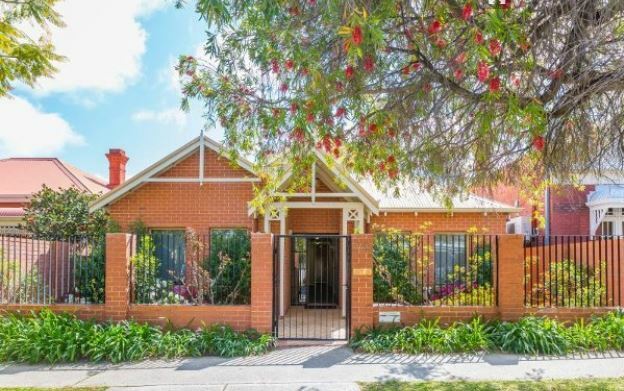 We are excited to announce that we will be moving in late July to our new premises located at 72 Churchill Avenue, Subiaco. We are giving you a little sneak peak today, but we have big plans for our new home with a massive renovation already underway. Make sure you stay tuned to this post as we will be showing you every step of the way – from demolition to decoration! We can’t wait to see you all at our new home! Medical “glue” treatment for Varicose Veins now covered under Medicare! The use of medical grade adhesive to treat varicose veins and venous disease is otherwise known as Endovenous Adhesive Ablation. Medical professionals have been using medical grade adhesive “medical superglue” for years to treat a large number of ailments. As of May 1 2018 this procedure for vein treatment will offer patients a Medicare rebate! To see if this treatment is right for you, book a consultation with Dr Sanjay Nadkarni. The anterior cruciate ligament (ACL) is one of a pair of ligaments (the other being the posterior cruciate ligament) in the knee. The two ligaments are also called cruciform ligaments, as they are arranged in a crossed formation. The anterior cruciate ligament is one of the four main ligaments of the knee and is one of the key ligaments that help stabilize your knee joint. The ACL connects your thighbone (femur) to your shinbone (tibia). Anterior cruciate ligament injury is when the anterior cruciate ligament (ACL) is either stretched, partially torn, or completely torn. 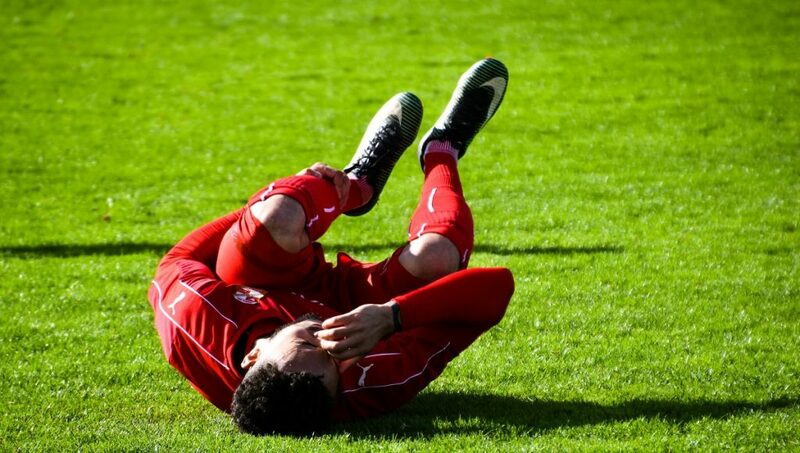 Symptoms include pain, a popping sound during injury, instability of the knee, and joint swelling. It’s most commonly torn during sports that involve sudden stops and changes in direction — such as football, basketball, netball etc. Treating partial anterior ligament tears with intraligamentary plasma rich has proven successful in many cases. This is a 20 minute procedure conducted at the clinic. Dr Sanjay Nadkarni has been performing this procedure for over 7 years, since it was first introduced. A recent study published in the World Journal of Orthopaedics showed excellent results for this procedure. Click here to view the full study. 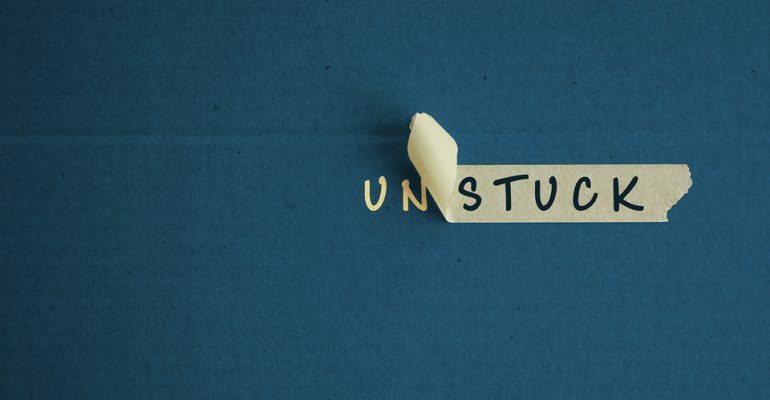 Adelaide finally had the answer to her chronic pain that she had been looking for. Dr Sanjay Nadkarni was able to diagnose and treat Adelaide’s condition and restore her quality of life. It took two minimally invasive procedures and Dr Sanjay Nadkarni interviewed Adelaide pre- operation and post operation for each procedure. We will be posting these in a series of blogs. If you are suffering chronic pelvic pain, you are not alone. This condition is extremely common in women post pregnancy. Get a referral from your GP to see Dr Sanjay Nadkarni. 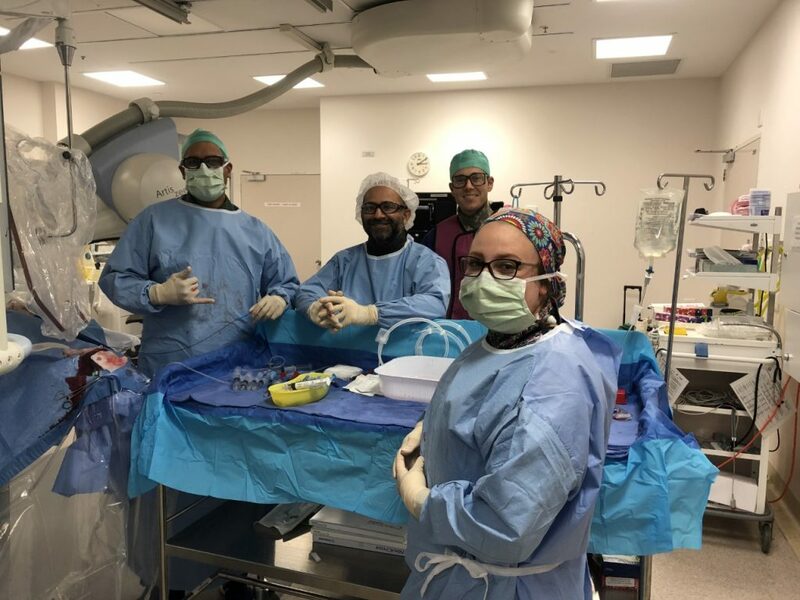 Congratulations to our very own Dr Sanjay Nadkarni who on Friday, April 6 became the first ever Interventional Radiologist in Western Australia to perform a radial artery puncture procedure as part of a uterine artery embolisation. Uterine fibroids are extremely common in women and if left untreated can continue to grow in size and number. This procedure allows patients to sit up and even walk almost immediately and in most cases the patient will be home the same day. Dr Nadkarni asked us to give a shout out to the interventional radiology department at Sir Charles Gairdner Hospital who have been offering world class care to patients for 25 years. Varicose Veins increase the risk of DVT by 5 times! Varicose veins are NOT just a cosmetic issue. New research shows that people suffering from varicose veins are 5 times more likely to develop a DVT (deep vein thrombosis) which can result in amputation or even death and 2 times more likely to develop a pulmonary embolism which can also be fatal. With so many minimally invasive, non surgical vein treatments available there is no reason to risk your health.